I've read that Dragon Ball Z Kai is an HD remaster and recut of Dragon Ball and Dragon Ball Z. However, Kai has 98 episodes while Dragon Ball has 153 and Z has almost 300. If I watch only Dragon Ball Z Kai, do I miss anything I would get by watching the other two series? And is anything censored in Kai that is not censored in the others? First off, Dragon Ball Z Kai doesn't include anything from Dragon Ball, which is the story of Goku as a child. Secondly, the main difference is that Kai lacks the filler content of the original Dragon Ball Z, and stops at the end of the Cell saga. By filler I mean content not originally in the manga. Some (like myself) enjoyed the filler, while others thought it to be extra fluff. Kai is more faithful to the manga than the original anime was. In some cases though, this could affect how some see the development of characters. For example: In the original DBZ, one of the most intriguing, and perhaps touching, moments is Gohan surviving alone in the wilderness. The challenges and events he faces, as well as the people he meets, all influence the person he becomes later on. 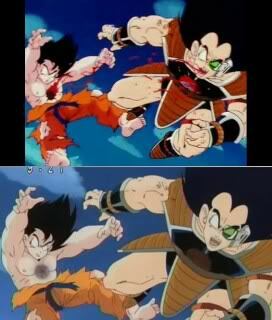 Much of this was cut in Kai, and so, unless you've already seen DBZ, it might seem a little choppy. By ending at the Cell saga, it ends in the place where the original author Akira Toriyama wanted it to. In doing so, you miss the two-three seasons that came afterward. The are also other small differences between the two, including different music in some cases, and new scenes added/redone in Kai. As for censorship, some scenes where updated to fit the new standards of Japanese Television. In American productions of the anime (namely dubs), there could have been further censoring. I can't remember the name of the company at the moment, but one went so far as to make the character Mr. Popo blue, to lessen claims of racism. Given the facts, you can make up your mind as to which you will watch, but in my humble opinion I would go with the originals first, and later on, if you want, you can look into Kai as an abridgment. As someone who has personally watched both, I must say that I only enjoyed Kai because I was able to fill in the details myself. If I had never seen DBZ I doubt I would have felt this comfortable. Kai is not too bad as I'm currently watching it on KIX. BUT! there are silly things chopped away from what I remember in Dragonball Z. Cell stomps and crushes Android 16's head after he's done telling Gohan to embrace his inner anger to defeat Cell. In Dragonball Kai, this is cut out and only Android 16's brain cartridge and a few bolts are seen MAGICALLY on the scene. Yet During the Frieza saga you get to see Krillin use 'Destructo Disc' to cut off Frieza's tail which did happen in both Z and Kai but this clashes with the head crushing. To me Dragonball Z DESTROYS Kai in every form and shape because its more influential in all the characters development. Not to mention I've yet to see Yamcha use his technique The Wolf Fang Fist. From what I've read as well we are going to lose out on the Majin Buu Saga, the Kid Buu Saga and the Super Android 17 Saga. Lastly it hasn't been mentioned from what I've read but even though it's only a filler what happened to the Garlic Jr saga? If I remember correctly it was based after the return from Namek. I could be wrong. So much is cut from Z, it's sort of depressing. Not the answer you're looking for? Browse other questions tagged dragon-ball-z dragon-ball-series or ask your own question.